Microcontrollers are capable of detecting binary signals: is the button pressed or not? These are digital signals. When a microcontroller is powered from five volts, it understands zero volts (0V) as a binary 0 and a five volts (5V) as a binary 1. The world however is not so simple and likes to use shades of gray. What if the signal is 2.72V? Is that a zero or a one? We often need to measure signals that vary; these are called analog signals. A 5V analog sensor may output 0.01V or 4.99V or anything inbetween. Luckily, nearly all microcontrollers have a device built into them that allows us to convert these voltages into values that we can use in a program to make a decision. An Analog to Digital Converter (ADC) is a very useful feature that converts an analog voltage on a pin to a digital number. By converting from the analog world to the digital world, we can begin to use electronics to interface to the analog world around us. Not every pin on a microcontroller has the ability to do analog to digital conversions. On the Arduino board, these pins have an ‘A’ in front of their label (A0 through A5) to indicate these pins can read analog voltages. ADCs can vary greatly between microcontroller. 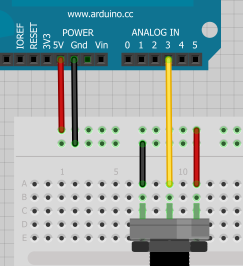 The ADC on the Arduino is a 10-bit ADC meaning it has the ability to detect 1,024 (2^10) discrete analog levels. Some microcontrollers have 8-bit ADCs (2^8 = 256 discrete levels) and some have 16-bit ADCs (2^16 = 65,536 discrete levels). The way an ADC works is fairly complex. There are a few different ways to achieve this feat (see Wikipedia for a list), but one of the most common technique uses the analog voltage to charge up an internal capacitor and then measure the time it takes to discharge across an internal resistor. The microcontroller monitors the number of clock cycles that pass before the capacitor is discharged. This number of cycles is the number that is returned once the ADC is complete. The value that is returned and stored in x will be a value from 0 to 1023. 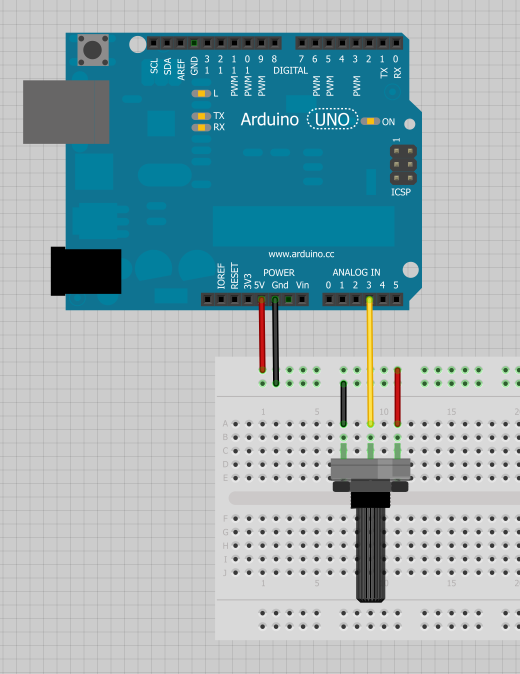 The Arduino has a 10-bit ADC (2^10 = 1024). We store this value into an int because x is bigger (10 bits) than what a byte can hold (8 bits). As we change the analog value, x should also change. For example, if x is reported to be 334, and we’re using the Arduino at 5V, what is the actual voltage? Pull out your digital multimeter and check the actual voltage. It should be approximately 1.63V. Congratulations! You have just created your own digital multimeter with an Arduino! 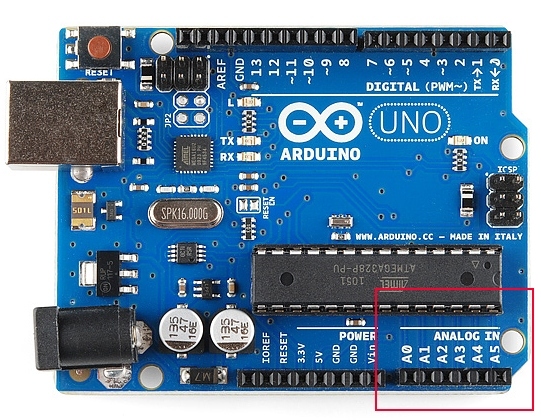 int x = analogRead(8); //Try to read the analog value on digital pin 8 - this doesn’t work! This will compile but x will be filled with a nonsensical value. What happens if I connect a digital sensor to an analog pin? Again, you will not break anything. If you do an analog-to-digital conversion on a button, you will most likely see ADC values very close to 1023 (or 5V which is binary 1) or very close to 0 (or 0V which is binary 0). Doing analog digital conversions is a great thing to learn! Now that you have an understanding of this important concept, check out all the projects and sensors that utilize analog to digital conversion.